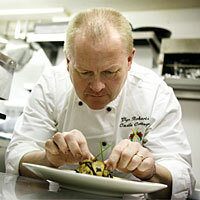 Glyn Roberts is Chef / Proprietor at Castle Cottage, Harlech. Your cooking style in a word (or two) : Modern Welsh with an eclectic twist. Biggest influence : Gary Rhodes in the 80’s, Ramsay in the 90’s. Favourite local produce : Cardigan Bay seabass. Apart from friends and family at Christmas (one of our few days off!) a dinner party to show off Welsh produce and talent to the many London based food critics who never venture to north Wales! Beluga Restaurant in Cape Town. Gin, red wine, walking, driving.